This year has been a series of set backs in my garden. It is almost the end of May and I’m way behind, but finally have some progress to show for all my work. My father’s death in February which resulted in two trips to Maine. A very long winter and very wet and cold spring here in NC. A sprained (broken?) wrist that stopped me cold in my tracks when I was almost done. I had so much planned for this year. I intended to double the size of my test garden (check), turn my vegetable garden into a mixed perennial/vegetable garden (check), and weed and edge all the other beds (6, count ’em – check). For the last month, since my second trip to Maine, I’ve been out in the garden for 4-6 hours every day. I have most of the projects done but I really did bite of more than I can chew this year (hence my wrist!). I never seem to know when to quit and take a rest. But after all that, I have some progress. Grab a cup of coffee and relax and take a virtual tour of what is blooming now in NC – zone 7b in May. Surprisingly, there are many plants that have a lot of growth ahead of them. Normally by this time of the year, my garden is very lush, but the late spring left its foot print out there in a big way this year. 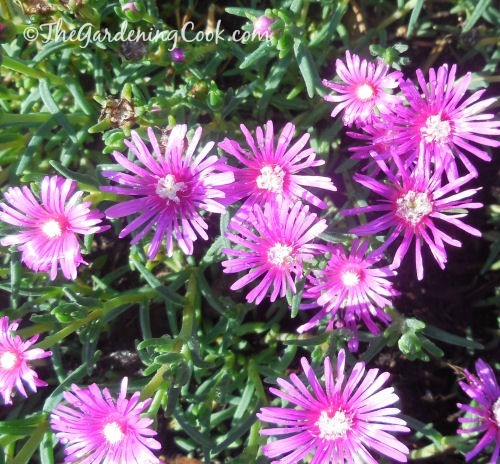 I love the flowers on this lampranthus, commonly known as purple ice plant. It spreads well but is not invasive and the flowers are very vibrant and cover the whole plant. 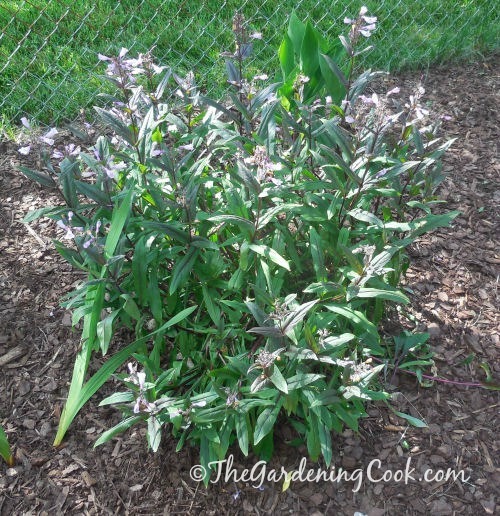 I moved clumps of the main plant to several of my garden beds. Foxglovesare one of my favorite plants. 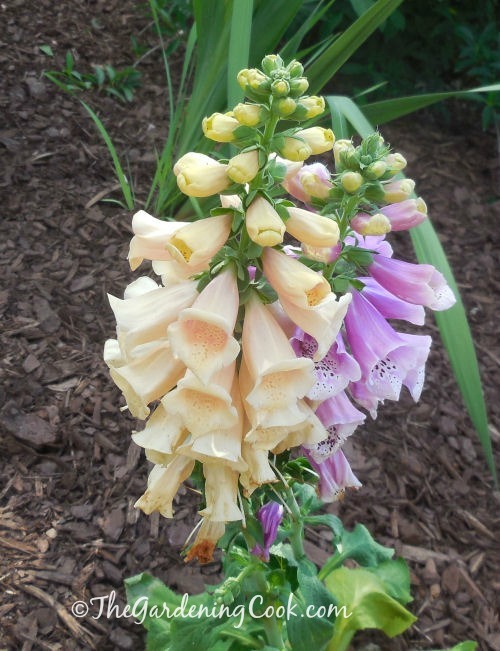 (affiliate link) They are a biennial but self seed so I always have them in my garden beds. This beauty has both pink and yellow on the one plant! This Weigela – Wine and Roses – was planted in my test garden last year and now it is a really good sized shrub – almost three feet tall. The purple flowers are profuse right now and the plant always makes me smile when I see it. 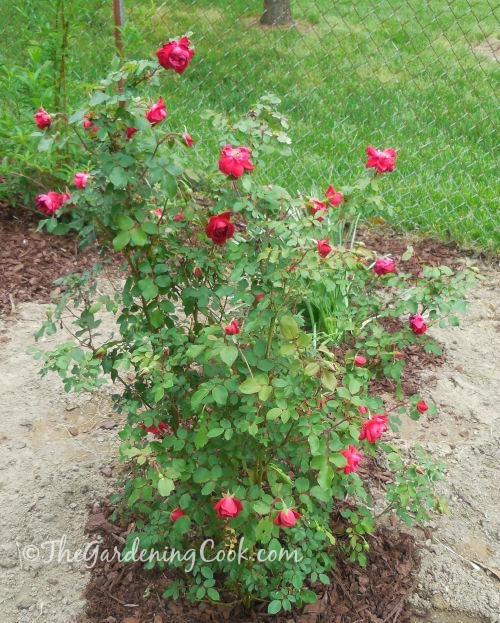 When I moved this plant from my shade garden this year, I thought it was a miniature rose. 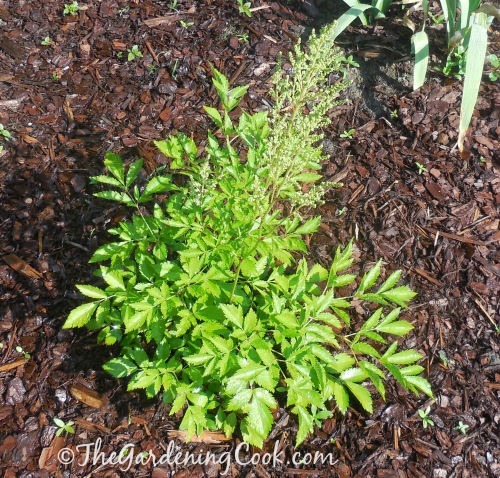 Much to my surprise, I have discovered that it is an astilbe, about ready to bloom. (affiliate link)It had no buds when I moved it! Fortunately, I placed it in a shady area of my mixed perennial/vegetable garden, so it will do well there. Can’t wait to see what color it will be! I forced this amaryllis last Christmas from a bulb. 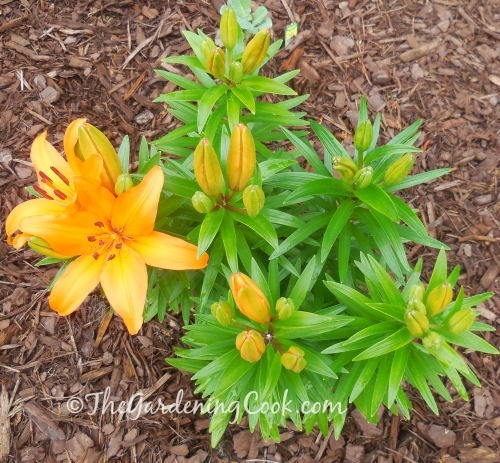 After it was done blooming, I placed it in my test garden to see if it would survive the winter. Much to my amazement it did. 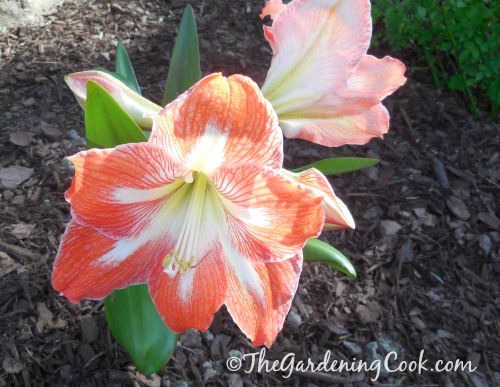 Amaryllis are tropical plants and normally you will find them in zones 9-10! You know you are a devoted gardener when you go to the nursery when it is pouring cats and dogs. 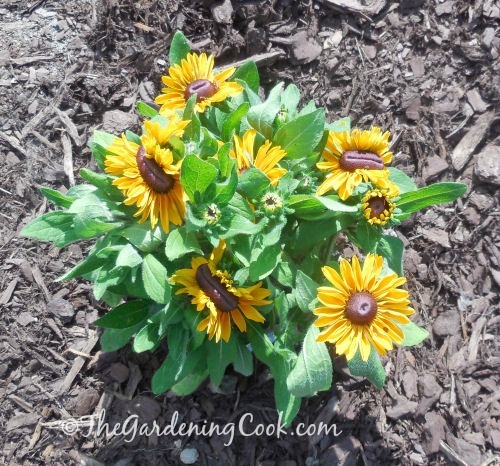 I grabbed this perennial when the buds were closed thinking it was a new one to my garden, only to realize it was a black eyed Susan, which I have tons of in my front garden bed. The flower buds on this plant are somewhat more substantial in size, so I am happy for my mistake. 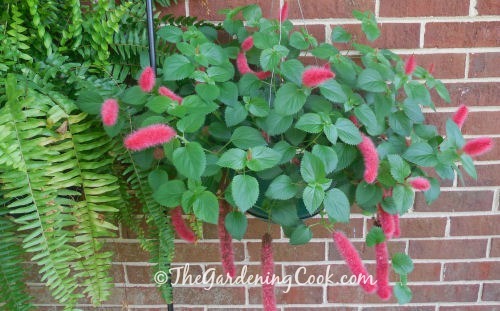 This is my second try for Acalypha hispida – more commonly known as a chenille firetail. I managed to kill the first one. The plant needs very even moisture with lots of sunlight. I’ll be moving it to my deck where it will get more light (and where I won’t forget to water it). Hopefully, it will survive the summer. It is an annual in zone 7b so it won’t be here next year, but I plan to take cuttings and have it indoors for next year. Fingers crossed! My husband always used to buy me lilies and (although I never told him so, I don’t like them indoors.) But outside is another story. I have all colors of them in my garden beds. This gorgeous orange yellow one is ready to bloom and has the most magnificent bloom. My birth flower is a daisy, and you would not know it by my luck with them. I have killed at least 6 plants. 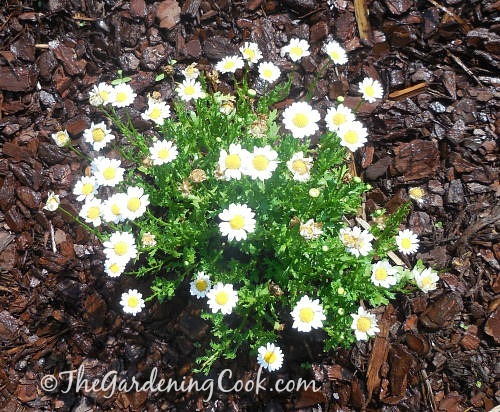 This year I am trying a small English daisy. It is in a semi sunny location instead of full sun. Hope it will do well this time! I love my birdbath too. It gives some extra decor to the garden bed and the birds all fight over it! See how to clean a cement bird bath. This purple liatris is a magnificent bulb. It grows to about four feet tall and this is my oldest specimen. 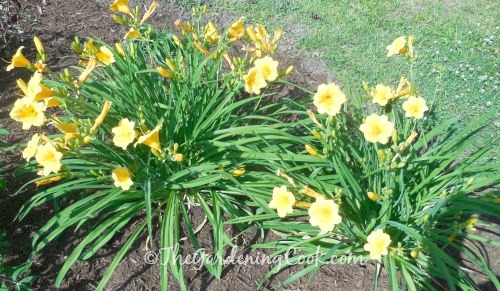 I moved clumps of these to all my garden beds this spring. This one is just about ready to bloom. The blooms will last for weeks and the bees love it. 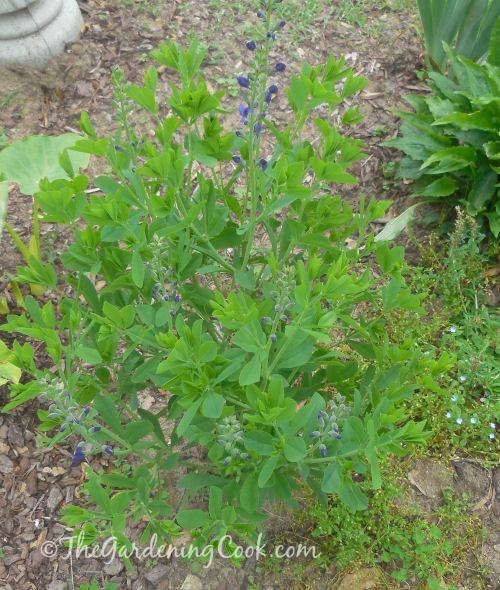 I moved a clump of this purple baptisia last year to my test garden. Baptisia is hard to move and takes a while to recover. (very long roots and it’s hard to get them all when you dig up a section of it.) But this one took well and is now about 3 feet tall and wide. It is covered in small purple flowers that the bees love. 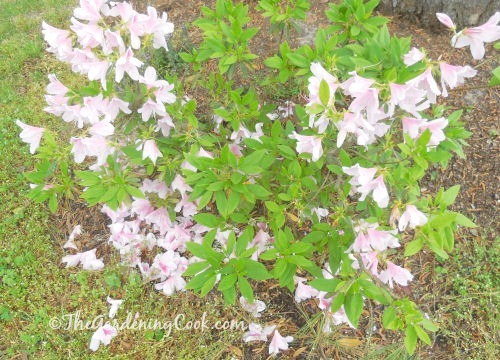 No May garden picture for NC would be complete with an azalea or two. 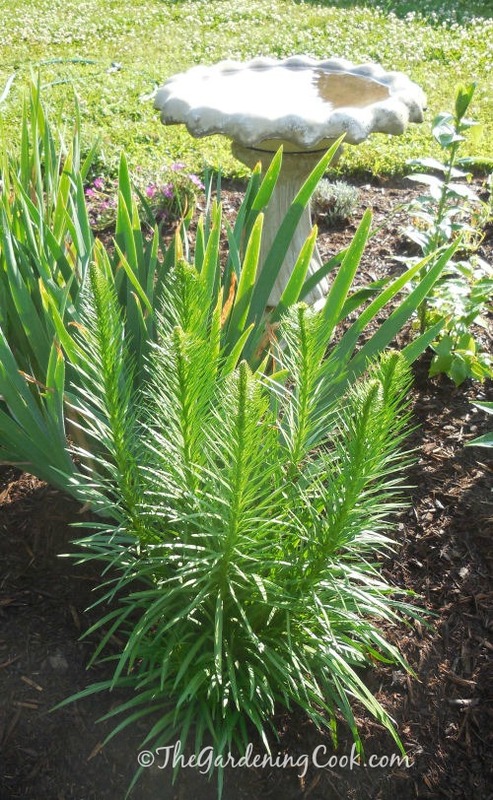 I have these planted under my pine tree and they love the acid soil. It is done blooming now but was a great show of flowers a few weeks ago. 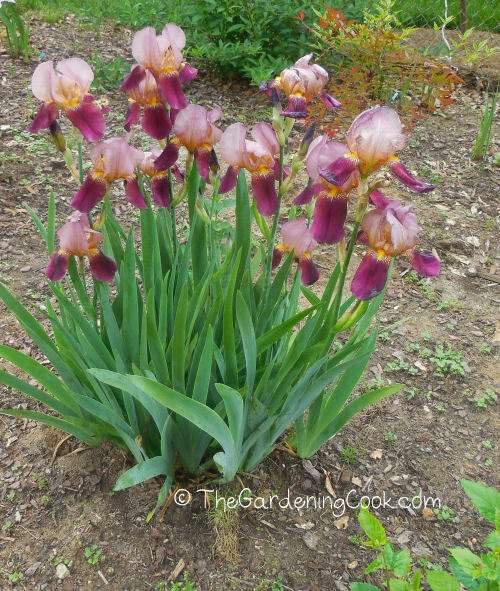 My mauve and purple bearded irises have just finished blooming. I moved these from an old well casing last year and they were magnificent this month. Last but not least for the time being. 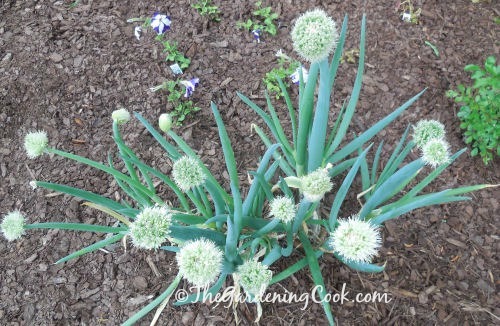 This patch of spring onions just never ceases to amaze me. I planted these from seed in late January last year. The were originally one long row. I used them over the summer, fall and winter and this is the patch that is left. I won’t dig these up. I’ll just cut them and they will come again. Now they are in full flower! 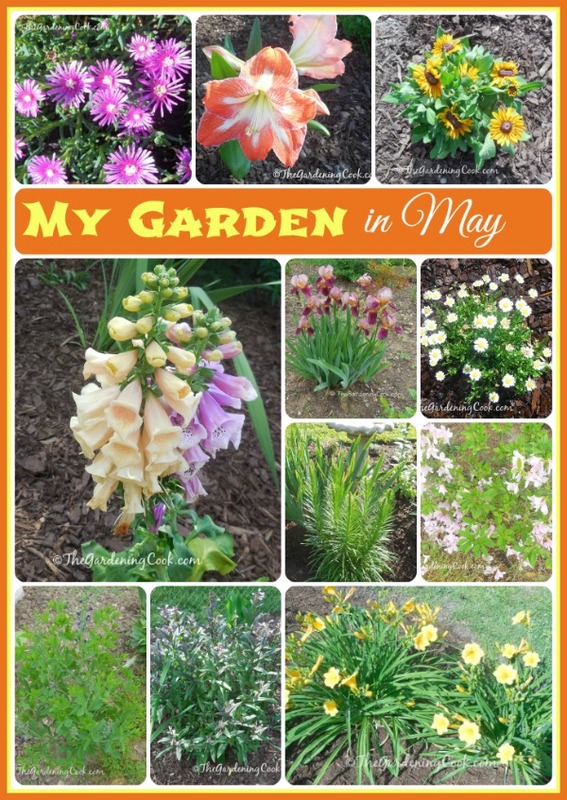 I hope that you have enjoyed my garden in May tour. It’s a bit late for the post – almost June and time for next month’s show! Your garden looks awesome!! It really has been a long winter and so many things are behind. But you need to sit back and enjoy those beautiful blooms and let that wrist heal, my friend. I’m trying. It’s been two days with no gardening. I am in withdrawal! I really enjoyed seeing your flowers and the identification with explanation. It was very helpful to a new gardener. Thanks. I am looking forward to June’s flower show. Sorry about the loss of your Dad. Hi Sharon, I’m glad you found the article helpful. Thank you for your kind words. Hi Michelle, Thank you for the kind words. There is a subscribe form on the left side bar under the search button. You will love to see how many more things you can grow in 7a. I moved south years ago from Maine. Gardening is very different here!